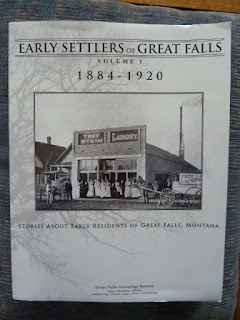 Janet Thomson is a member of the Great Falls Genealogical Society and is the principle editor of a 2-volume set of books, Early Settlers of Great Falls (Montana), 1884-1920, Stories About Early Residents..., Volumes 1-2. Great Falls is on the upper Missouri River and was first documented by Meriwether Lewis on the historic Lewis & Clark Corps of Discovery Expedition (1804-1806). He wrote that he could hear the thunder of the falls (which turned out to be a series of falls) from a day's distance. The town of Great Falls was founded in the spring of 1884 and grew slowly until the arrival of the railroad in 1887 and "every person of the 3,500 population of this city turned out to give a grand welcome to the first train." She graciously donated the two volumes (nearly 450 pages) to EWGS......... they will become part of our genealogy collection in the downtown Spokane Public Library. Have you any ancestors who might have resided in Great Falls, Montana, between 1884 and 1920? 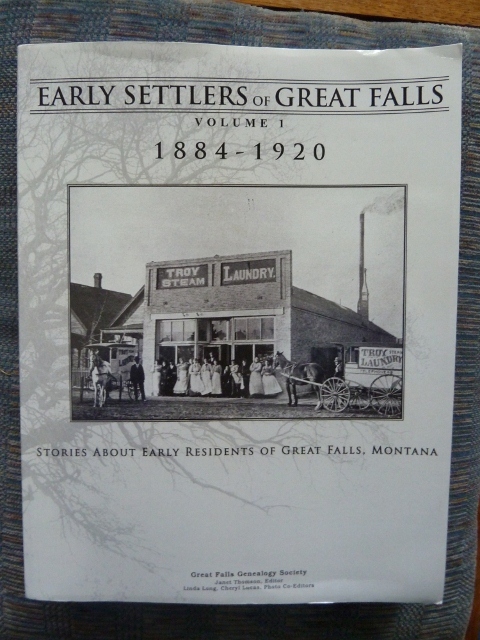 Volume 2 of this series is 200 pages of "Stories About Early Residents of Great Falls, Montana." Do put this on your To-Do list to look at on a future visit to our genealogy collection. Haven't you always enjoyed books? Haven't most of you been avid fans of your public library? Most likely it was the first place your parents let you go to alone? I went to 1st through 4th grade in Fairfield, California, and I well remember the statue of Chief Solano standing tall by the main entrance. I think it was that statue that helped foster my interest in history.... and thence to books to learn that history. 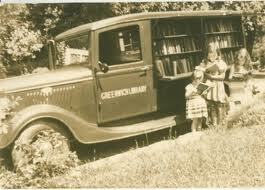 But how many of our ancestors had access to books via the once-a-month Bookmobile visit? And did you realize that our Spokane Public Libraries still has a boookmobile going to selected spots? If you value libraries, please vote YES for the library levy on Feb 12th. An informed citizenry needs libraries; we genealogists need libraries. Vote YES. Get your friends and neighbors to vote YES too. Thomas MacEntee, Flip-Pal mobile scanner ambassador, is a genealogy professional specializing in the use of technology and social media to improve genealogy research and as a way to connect with others in the family history community. He shares his thoughts on why we search for our ancestors. As I’ve become more involved in the genealogy community and I’ve built up my own genealogy-related business, I find I am often asked to give interviews. I like being interviewed and I will reply to almost any request for an interview as long as the questions are genealogy-related and it helps bring more people into the family history community. In addition, after moderating many panels for genealogy conferences and events, plus hosting my own radio show, it is fun to be on the other end of the microphone, as it were, providing my thoughts on genealogy. The Question: Why Do You Do Genealogy? My usual response “Well, why not do genealogy?” gets a few laughs, but really doesn’t stress the importance of why I and millions of others are obsessed with tracing their ancestry and heritage. Do you ever get so wrapped up in the “hunt” that you sometimes lose focus as to why you want to know more about your ancestors? Is “doing genealogy” such a large part of your life that the motivational factors sometimes defy description? Do you have trouble putting into words what researching your roots means to you? They fear that I’ve become the equivalent of an ancestor “hoarder” and that they’ll have to tunnel through 20 years’ worth of genealogical records to find my body one day. When I use terms like “citing sources” or “ahnentafels” to them I may as well be speaking in tongues. The fact that I can draw a four generation tree of my family from memory does not mesmerize them. It only gives them hard evidence in the form of a written document to be used when and if I should be committed. I don’t think it is really that bad. However, when I attempt to explain the things I do (which seem normal as a genealogist), I get frustrated. It is like trying to explain to someone why you follow a certain spiritual path or a specific faith. · If we’re lucky, we discover genealogy when we are young, either through an older family relative or at school. · Our family members may have stressed the importance of knowing our heritage, of telling family stories and sharing old photos. · We may have dabbled with different hobbies in college, but we always came back to genealogy. · We attend weekly or monthly gatherings where we meet with other genealogists and discuss what genealogy means to us. · Our community has leaders and those who preach about various aspects of genealogy. Some are so popular that we pack classrooms and worship them as idols. · We keep the family traditions and place them in context by explaining to others in the family the origins of certain customs and practices. · Old documents and records not only feed our obsession, but we often hunger for more and are willing to volunteer our time indexing them and advocating for their unfettered access. 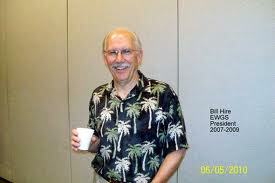 · You know another genealogist either when you see them or the minute you start talking to them. There is a certain kinship, a certain bonding as you swap surnames and discuss your brick walls. See, it really isn’t such a far-fetched an idea after all. Genealogy brings meaning to our lives in so many ways that, again, we can’t often explain it, even to our close loved ones. It is a path, a journey and has its own strange practices and routines. So how do you put all this in words when attempting to answer that “why” question? It might just be easier to “show” rather than tell. I’ve learned that once I can show a person photos, stories and how my ancestors fit into history, I get to see that arched eyebrow, or that glimmer in the eye. Then I know I’ve started to make sense. 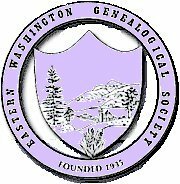 At the January Luncheon meeting, Bill Hire was honored and added to the list of the Eastern Washington Genealogical Society's Distinguished Service Members and presented a certificate for same. Congrats and kudos to Bill for being so recognized and honored by his peers!